Matched betting software guide & how oddsmatcher will make you money! Matched betting software guide and how the oddsmatcher will make you money! The matched betting software that is available at a matched betting service like Oddsmonkey will save you so much time each month as well as making you a lot more money than if you were to do it on your own. Time is money and why would you want to spend your time looking endlessly for the best matches available to you when the matched betting software does it for you. I pay £15 a month to use Oddsmonkey and I treat it like a business. I pay them £15 so they can do all the hard work for me which will make plenty of money for me in almost no time at all. The alternative would involve me on my computer all day long looking for the best matches to place and manually working them out to see if it is worth doing. Oddsmonkey has developed in-house matched betting software that stretches out to all the different kinds of bets you can place. They have single bets, each way bets, extra place, each way betting and accumulators covered which enables you to guarantee a profit no matter what kind of bet you wish to place. The Oddsmatcher is the original matched betting software that made Oddsmonkey famous as it was one of the first companies to develop this type of software and bring it to the market. The Oddsmatcher compares the bookmaker’s back odds with the exchange’s lay odds. It then ranks these comparisons (matches) in order of how close they are. The closer the odds, the lower your qualifying losses will be when doing the first step of matched betting. You will also notice some number highlighted in red and have a number over 100. These are arbitrage bets or arbs. Arbs are the types of bets which will quickly get your betting accounts restricted or banned so I would avoid placing bets on any match where the numbers are in red. The Oddsmatcher also has a useful filter button which allows you to select the minimum back odds, how many days in advance you want the event to take place, which betting exchange you would like the Oddsmatcher to search for only and many other useful characteristics. This matched betting software will save you so much time when looking for bets to place as it does all of the searching for you and finding the best matches. This then allows you to login to the bookmaker account, place the bet and then login to your exchange account, place the lay bet and then profit, easy! The Oddsmatcher also is very convenient as you can load up the matched betting calculator within the same software which makes the process of matched betting even quicker for you. If you click the “i” button next to a match like the image below where I have highlighted these in red, this will load up the calculator so that you can work out the lay stake on the bet and jump on the bet a lot quicker. The matched betting calculator is one of the most important tools you will need when doing matched betting. When you have used the Oddsmatcher tool, you will need to use the calculator to work out your lay stake and liability needed for the betting exchange. This will ensure your risk is eradicated and that you make a profit no matter what the final result is. You simply enter the back stake at the bookmaker in the blue box, and then enter the back odds at the bookmaker (in decimal format). Then enter the lay odds at the betting exchange along with the lay commission the exchange charges. Once all this information is entered, the matched betting calculator will automatically work out the lay stake you need at the exchange as well as telling you how much money you will need in the exchange (liability). You may be wondering how this will save you so much time, well the fact that it automatically works the calculations out for you is a big help and also is useful for those who aren’t as skilled at maths! So you have nothing to worry about when using the matched betting calculator. The matched betting calculator also has an advanced mode which is useful for when you want to underlay or overlay your bet. To underlay a bet, this means your lay stake will be lower (literally under-lay!) which will mean you will make a small loss should the back bet lose and you will breakeven should the back bet win. Underlaying is a good technique to use when you are dealing with a bonus bet which requires a rollover. I always do this. What it means is that if you lose the back bet, you will quickly make a profit as there is no more rollover to do and you have already walked away with the money. If the back bet wins, you will breakeven which means you will not have lost any of the bonus funds. With the rollover to complete you will end up losing a small amount of the bonus but this ensures you do it as profitably as possible. So if you are doing a bonus with a rollover attached to it, I would always go for the underlay option. It is better to lose £1.00 of a £50 bonus (which means you make £49.00) than to get caught up in a time consuming rollover and still losing parts of your bonus. To overlay a bet, this means your lay stake will be higher (literally over-lay!) which means you will make small loss should the back bet win and you will breakeven if the back bet loses. Overlaying is a good strategy to use for when you will guarantee a free bet if the back bet wins at the bookmaker. You will take a small loss but then receive a free bet which you can then make money from. A good example offer to do this on is the Betfair 3/1 offer or the Bet365 4/1 offer. In the same example above, you would lose £4.08 but then receive a £50 free bet which you can expect to make £35-£40 from. The rest of the time, it is best to just use the normal standard match as this will make all outcomes have the same profit or loss attached to it. The standard match is mainly for the qualifying bets for free bets where the stake is not returned (SNR). This will keep your losses low. The standard match is also best for free bets (SNR) as you will make the same amount of profit whether the bookmaker bet wins or the exchange lay bet wins. 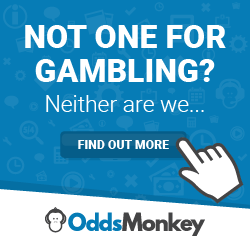 So save yourself loads of time whilst making more money in the process and join Oddsmonkey today to gain full access to their matched betting software and the matched betting calculator. Have a read of my impartial Oddsmonkey review here! Football matched betting tips, a guide to maximising your profits! Make money from no risk matched betting, my guide! Best bank account for matched betting and my best practice financial tips!